SINGAPORE, March 18, 2014: In an innovative approach to the Asian market for polymer compounds, Teknor Apex Asia Pacific Pte Ltd. has restructured its extensive product portfolio with the goal of offering customers in each end use market a multiplicity of raw material options spanning the broadest range of polymer chemistries employed by any custom compounder. The company (formerly Singapore Polymer Corporation) will introduce this “polymer neutral” strategy at Chinaplas 2014 (Booth N2-D43). The new strategy embraces all of the market segments served by Teknor Apex Asia Pacific, including automotive, medical, consumer, electrical and electronic, wire and cable, NSF-regulated, packaging, building and construction, and industrial. For any of these sectors the company’s product offerings may include rigid and flexible PVC, thermoplastic elastomers (TPEs), polyamide and other engineering thermoplastics (ETPs), uniquely formulated masterbatch compounds and a range of specialty compounds. Teknor Apex maintains a database of compounds in these product families that includes thousands of specific grades which meet a wide range of global and regional regulatory, industry, and customer specifications, can be produced in plants around the world, and provide identical performance and code compliance no matter where in the world they are used. As examples of the “one-stop shopping” capability available to customers in a given sector, Mr. Pritikin noted that in TPEs alone Teknor Apex draws on the broadest range of chemistries employed by any custom compounder: 1) styrene block copolymers (SBCs), including styrene-butadiene-styrene (SBS), hydrogenated styrene-butadiene-styrene (SEBS), and hydrogenated styrene-isoprene/butadiene-styrene (SEEPS); 2) thermoplastic vulcanizates (TPVs); 3) olefinics, including blends of polypropylene or polyethylene with olefinic TPE or with olefin block copolymer (OBC); and 4) bondable TPEs that can be over-molded or coextruded with many polyolefin, styrenic, and engineering resins. ● Consumer Products. Monprene® TPEs, globally available Apex® flexible and rigid PVC compounds, regionally-driven Sinvicomp® flexible and rigid PVC, Sinpolene® masterbatch products, Sinelec® conductive polyolefin and polystyrene compounds, and Chemlon® and Beetle® ETPs – trusted consumer brands. ● Medical. Apex® NT flexible and rigid PVC, Flexalloy® vinyl elastomers, Vital-Line® regionally-driven PVC compounds, and Medalist® Medical Elastomers – specifically developed for the healthcare segment with over 30 years of validated performance. Alternatives to DEHP-plasticized PVC compounds include products with non-DEHP and non-phthalate plasticizers and BioVinyl® compounds, which incorporate a bio-based plasticizer from renewable resources. ● Wire and cable. UL-listed Apex® flexible PVC compounds, which are also available with the full range of plasticizer alternatives; FlexalloyÒ vinyl elastomers; FireguardÒ low-flame, low-smoke PVC for plenum cable; Halguard® halogen-free flame retardant compounds; and Elexar® TPEs – wired for proven performance. 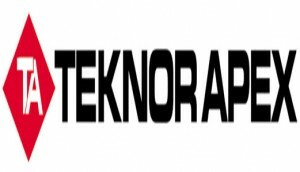 Teknor Apex Company operates manufacturing and development centers in Singapore and Suzhou, China with commercial and technical offices throughout the Asia Pacific region. TEKNOR APEX ASIA PACIFIC PTE LTD. is headquartered at 41 Shipyard Road, Singapore 628134. Tel: +65-6265-2544. Fax: +65-6265-1821. Email: [email protected]. Headquartered in Pawtucket, Rhode Island, U.S.A., Teknor Apex Company is an international supplier to the appliance, automotive, consumer, construction, medical device, packaging, wire and cable, and other industries. Parent company Teknor Apex operates manufacturing facilities around the world and sells in 90 countries. Six of the eight Teknor Apex business units focus on plastics compounding, including bioplastics; color concentrates; nylon; thermoplastic elastomers; toll and specialty compounds; and vinyl. Visit www.teknorapex.asia.